Introduction to Camping in Montreal – June 15-16! Hiking and French/English Conversation and Flowers! Intercultural Biking Club – Mondays Starting April 29th! Home Activities Upcoming Activities Intercultural Biking Club – Mondays Starting April 29th! Discover Montreal by bike! 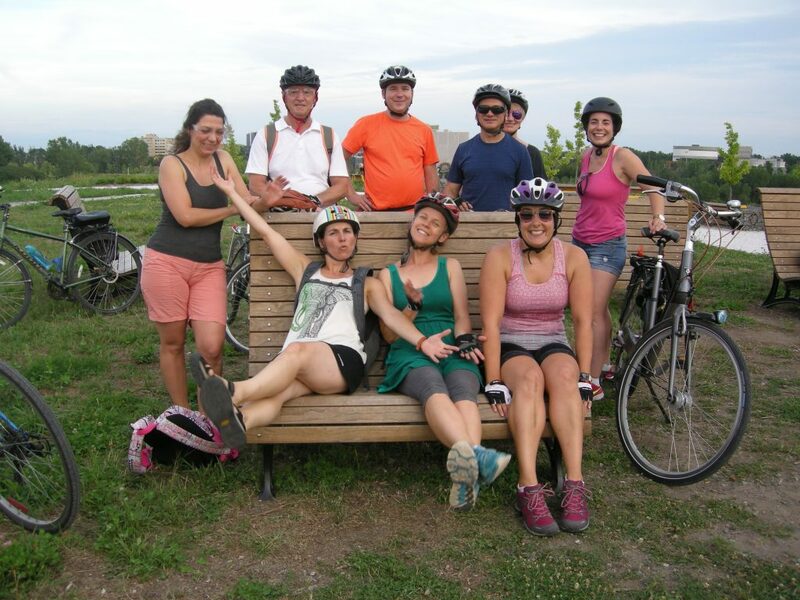 Join us for a series of 10 evening bike rides on Mondays to get some exercise and fresh air, explore Montreal’s waterfront, neighbourhoods and bike paths, and meet new people from near and far. Welcome to everyone! Please note that this schedule could change without notice. May 27 – climbing Mount-Royal! You will need to bring your own bike, lights and helmet (obligatory). The outings are mostly feasible by Bixi (though more tiring). Your bike should be in good repair and have reflectors. Please bring enough water, snacks, your health insurance card and information, your OPUS card and/or cash in case you need to return early by metro, and appropriate clothing for the weather. You will need to know how to bike. Distances will vary from 17 – 35 km. We bike at a “friendly” pace. It will be possible to shorten certain outings by coming home by metro. Meet at 6 pm at the corner of Rachel and Brébeuf in Parc Lafontaine, rain or shine. Rides will be cancelled only in case of dangerous conditions such as very strong rain or winds, and this will be decided onsite at the meeting place and time. We’ll return to the same place between 8 and 9:30 pm depending on the outing. For the picnics during our June 17 and July 22 outings, please bring something to eat and share with others, as well as a small bowl and utensil. If the weather calls for rain, we will go out to a restaurant instead. These two outings will end later than the others. Cost: $20 plus taxes plus a $10 annual membership card to ARMP for 10 outings. Starting at $5 plus taxes and membership card for low-income new Canadians. Registrations: Space is limited. Via my colleagues at the Milton Park Recreation Association at https://www.amilia.com/store/en/armp/shop/activities/2137178, 514.872.0566 or 3555 St-Urbain.